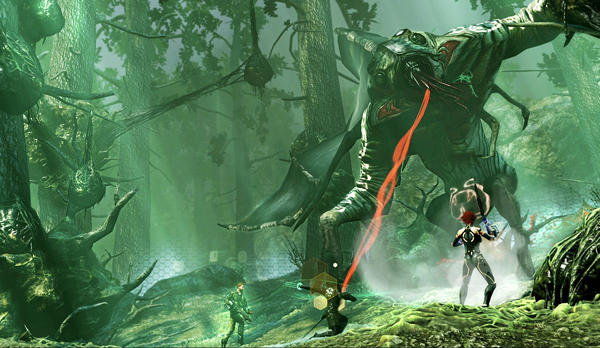 If you haven’t played The Secret World before, you may be wondering what the hell it is all about. I know I had no idea until I had a serious attempt at playing it. So it’s good to see that Funcom have belatedly posted a nice overview of the game and what it offers. 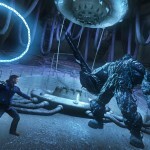 Called Experience The Depth Of The Secret World, it gives a decent snapshot of the key gameplay aspects. It covers off dungeons, gear, glyphs, signets, PvP and mastery of the game. 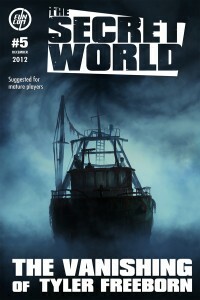 If you know someone who’s been considering checking TSW out, point them to the guide so they can make a more informed decision. But first, we’d love your thoughts on the guide and whether it covers all the bases. Does it paint too rosy a picture? Let us know in comments. As you may have heard, I recently agreed to take on the mantle of Creative Director for Funcom’s live titles: The Secret World, Age of Conan and Anarchy Online. It’s a huge honor to step into this role on multiple projects and have the ability to drive forward the creative direction of three of the most unique titles in the MMORPG space. It doesn’t change my role on The Secret World – the shared new team means that updates for The Secret World will continue like before – and we have plenty of exciting things coming up! Today I want to take a little bit of time to talk about the content roadmap for the game in 2013. Normally I would have done this in January, but I preferred my previous letter to focus on the restructuring and the upcoming Issue #6. 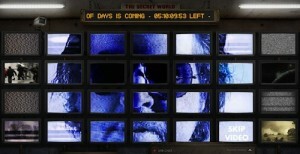 So what does 2013 hold for The Secret World? Let’s take a look at some of our current content plans, but keep in mind that things might change. MMO development is a constantly evolving, dynamic process, and we need to make sure we don’t lock ourselves down too tight. The further out the plans are, the more they are likely to change, but as of now, this is a rough outline of what we want to do going forward. We started out last week with a few small additions for the romantic among you. Head to London and try out the new compatibility tester to find your perfect match within The Secret World, and send that special someone a card, flowers or any spare body parts you have lying around. Coming up very soon is Issue #6: The Last Train to Cairo. We are working towards releasing this in early March, with our members and life-time members being allowed in two days earlier. Issue #6 contains a new multi-layered storyline involving Said, Nassir and Abdel Daoud and leads you through the past and the present to steal a valuable artifact from a roman cult and thwart the atenists plan to turn Cairo into a second Tokyo. We are planning to reveal the issue cover and a lot more information about Issue #6 soon so stay tuned! Issue #7 will see you returning to Transylvania when your Council of Venice contact, Carmen Preda, asks you to look into the appearance of a strange new monster in the region. In tracking down the creature, you will work with the Vampire Hunter, revisit old friends at the Romany Camp, and be introduced to a new character who will lead you deeper into the mysteries of the Carpathian Fangs and the Orochi presence there. If I had to describe Issue #7 in one sentence it would probably be “James Bond vs Eldritch horrors”. Of course, we will be adding another new Auxiliary weapon in Issue #7 and we’ll talk more about the features of the Issue as it grows closer. Issue #7 should end with a bang, a bang that starts a new in-game event that will run right up until we introduce the Tokyo zone. In Issue #8, we will change things up a little, moving away from our story arc DLCs to introduce a new repeatable content feature. This feature will add value to everybody who plays the game, from relatively new players to veterans in the best gear. 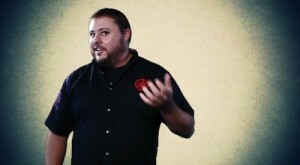 More details on the feature will be announced as we get closer to the date. Issue #9 – 11 we plan to release our first new urban adventure zone, Tokyo. We are still deciding the exact breakdown of the Tokyo DLCs, but Tokyo is the continuation of the story mission and will contain a new lair, a new dungeon and a plethora of new action, sabotage and investigation missions. Issue #12- ? Now we are getting into forbidden knowledge! This is another new adventure zone, directly tied to revelations in Tokyo and exploring the background of one of the more notorious factions in the game! So that it is, our current plans for the PvE content roadmap for The Secret World for 2013. Note that it doesn’t include new features – those are a part of a separate roadmap which also includes our plans for PvP. Soon we will be putting out a blog update on the PvP system and our plans for it, so keep your eyes peeled for that to hit soon! As mentioned earlier we will also reveal the cover for Issue #6 and more information on its content and features, hopefully early next week. Thanks for listening, and I look forward to seeing you all in the game! So – what do you think? That’s a hell of an ambitious content plan for the coming year – do you agree? 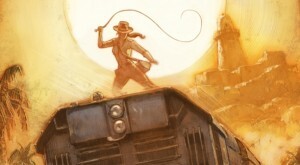 After a much deserved ‘break’ (although I somehow doubt any holidaying has been occurring) after the frenzy of the End of Days event and Issue 5’s release, Funcom’s TSW team have announced some details on the next content expansion: The Last Train To Cairo. A new Veteran and Recruitment system will become available. For each month you are or have been a member you receive points which can buy unique rewards. Every new person recruited also gives you an amount of points equal to a month of Membership. What’s your take on what you see – anything you particularly like or dislike about the details unveiled? 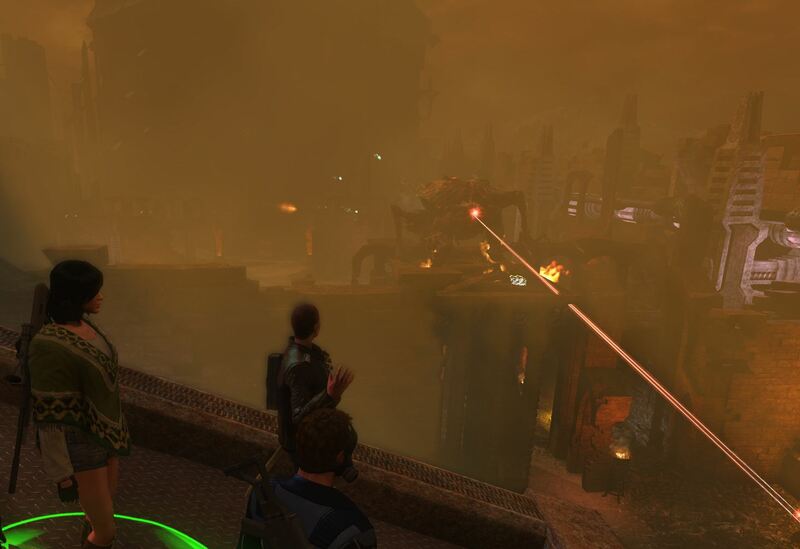 The TSW dev team have posted an update on how the pricing of future downloadable content will work. For what it’s worth, I quite like the approach and if you’re a Member or Grandmaster you’ll want to read about how to set up an auto upgrade to the new content. The current price of the Issue #5 DLC (The Vanishing of Tyler Freeborn) has been adjusted to 750 points for non-members, 675 for members (after 10% member discount), and will remain at 600 (after 20% Grandmaster discount) for Grandmasters. This pricing change was meant to further reward Members and Grandmasters because the 10% Member and 20% Grandmaster discounts for shop purchases are now also applied to DLC. Note that it is now possible for Members and Grandmasters to select to automatically upgrade to the DLC once it is available! 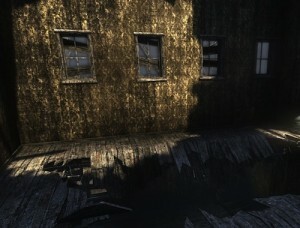 This option is called “Set up DLC Autobuy“ and is available from your account page (http://register.thesecretworld.com). Note that this setting is set to “off” by default, so you must actively change it if you want this functionality. We are also instating a cap on the DLC price for Grandmasters and Members. Regardless of the base (non-member) cost of a DLC, even if it starts at above 1200 points, the price for Grandmasters and Members will not be above 1200 points. This is also an additional bonus for Grandmaster and Member accounts, since it means they will always get enough points in a given month to purchase the newest DLC package. For future DLCs Members and Grandmasters get access to the content 48 hours before non-members. This will be live with DLC #6. Prices in the shop are always subject to change (up or down); prices for future DLC will vary based on the amount of content included and may be more expensive than this first DLC. We hope this announcement sheds some light on recent DLC pricing changes and we thank you for your patience as we continue to adjust and improve the Grandmaster and Member experience. What’s your take – do you like how things are now set up? I tell you what, I’m starting to wonder if the folks at Funcom ever sleep. 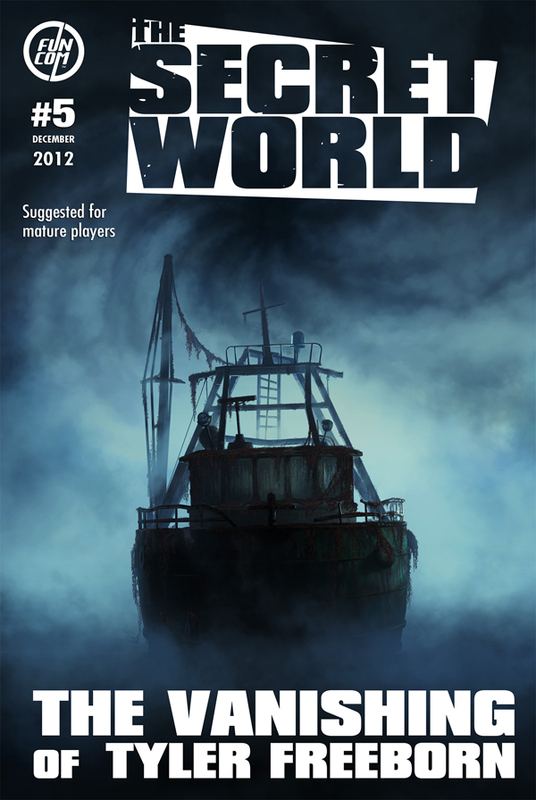 The Issue #5 content update for The Secret World is now live. I love the look of the new Quantum Brace weapon, and am hanging to start the new story arc. That said, the highlight for me is a simple one: hotkeys for inventory items. I’d argue it’s well overdue and I know it’ll help me improve my gameplay considerably. The casual player in me hopes that the TSW crew are taking a little break so I have time to catch up with all the new content! What about you – what catches your eye the most with this update? Funcom have just posted a developer blog post detailing the in-game events for the ‘End Of Days‘ fun occurring at the moment. The Mayans called this Age’s Harbinger Bolon Yokte’ K’uh. The Mayans envisioned this as an anthropomorphic “God of Nine Destructions”. This may have simply been a way to cope with the incomprehensible. We’ve gone all the way with the “big dude with attitude” interpretation, and he’ll be a boss fight available for a limited time at two different difficulties in a corrupted El Dorado, run amok with blood sacrifices and dark storms. Sounds like a bit of fun! There’s a contest running for players who knock over a bunch of Harbingers alongside El Dorado and the odd zombie, with the prizes being a unique pet and title. Will you be going for the prize? 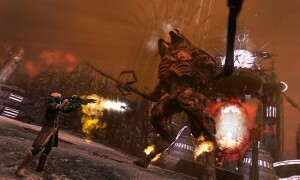 As we reported last week, The Secret World’s Alternate Reality ‘End of Days’ game is coming on December 21st. 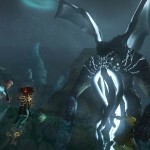 In the lead-up the fun’s already started, with two missions released to date. It doesn’t matter if you own TSW or not, although if you don’t own it you won’t be able to claim your in-game prizes. Having done both missions so far I have to say it’s a lot of fun and the atmosphere of things syncs beautifully with the game. One shameful admission though, for Mission 2 I had to resort to spoilers to solve the investigation mission (and I’m so rubbish at maths morse code I gave up on those routes as well). Shame on me. If you want to jump in and check it out, here’s where you go. Now it’s over to you: have you enjoyed the missions so far? With mission two, which route did you choose and did you try to do them all? Well knock me over with a feather. 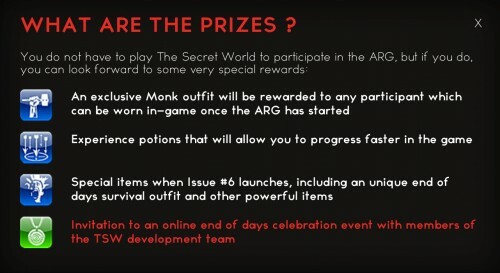 After recently saying how I doubted TSW was about to go F2P, that’s just what it’s done*. You get points which will more than cover the DLC. The reason that we give you points rather than giving the DLC is because the DLC will cost *less* than the points you get. Which means instead of getting nothing as a lifetimer except free content, you get the content and whatever you want to spend the points. Also consider if we were to slip in delivery by a month – you still get real tangible value that can be spent. 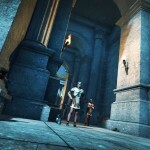 So it’s over to you – What’s your take: is this a good move for TSW? *Yes I know that the model isn’t strictly F2P as you need to buy the game up front, but I take a broader interpretation and it’s also a more commonly used term than Buy To Play. Mankind has been warned. On December 21st there will be a cataclysmic event that marks the end of time as we know it. It is time to prepare. Leading up to this world-changing event is a brand new alternate reality game (ARG) set in and around The Secret World universe, which will allow you to better prepare for what is to come. 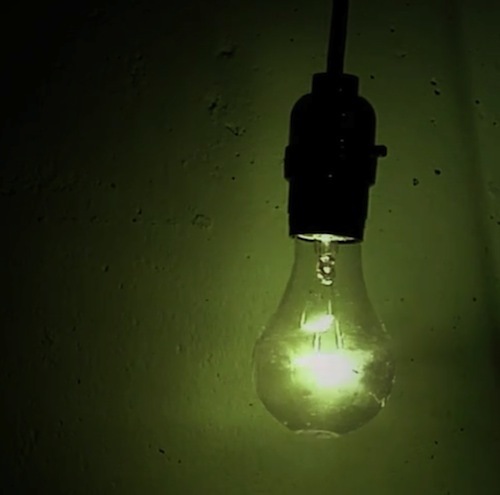 If you have never participated in an ARG event before, this is your perfect chance. And quite possibly your last. This might be your one chance to save yourself from this inevitable cosmic event, and we encourage you to pre-register to take part in the ARG. Pre-registration is free and available on this page. The ARG will start in a few days and this is one train you do not want to miss. 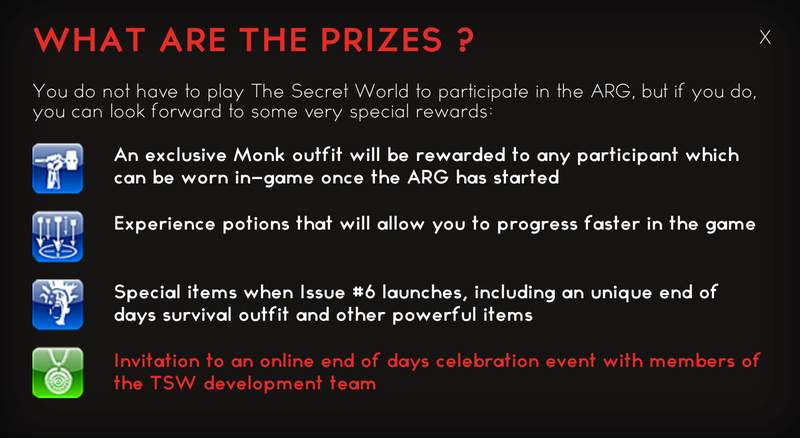 You do not need to be an active The Secret World player to take part, but if you are, note that exclusive prizes will be offered to all those who participate and that you will be able to enjoy these before everything comes to one last, screeching halt on December 21st. I’ve always been looking for a reason to get involved with an ARG and now I have no excuse to do so. My only selfish criticism is that this is one hell of a time of year to be running it – so here’s hoping that not too many hours need to be sunk into it. Over to you: will you be taking part?